RINGO3 observations are usually prepared or 'sequenced' like any other imaging observations. We suggest users therefore read the Phase2 UI User Instructions for IO:O prior to preparing RINGO3 observations. On this page we only address the few features specific to RINGO3. We recommend selecting a gain of 100 when defining the Instrument Config (see below for further details). Note also that the Exposure defines the duration of the entire observation. The rotation rate of the polaroid is fixed at roughly 0.25 Hz. Eight exposures are obtained per rotation, so in a 100 second exposure 200 images would be obtained in each camera. Also, the three cameras in RINGO3 observe simultaneously. The same observation duration and readout rate is used with all three cameras. SLEW: a slew to the target. Only one target is allowed per group. FOCUS OFFSET: telescope defocus (if this is non-zero) - OPTIONAL. FOCAL PLANE: sets the Focal plane for RINGO3 observations. AUTOGUIDER CONFIG: Acquire a guide star and switch on the autoguider if requested. 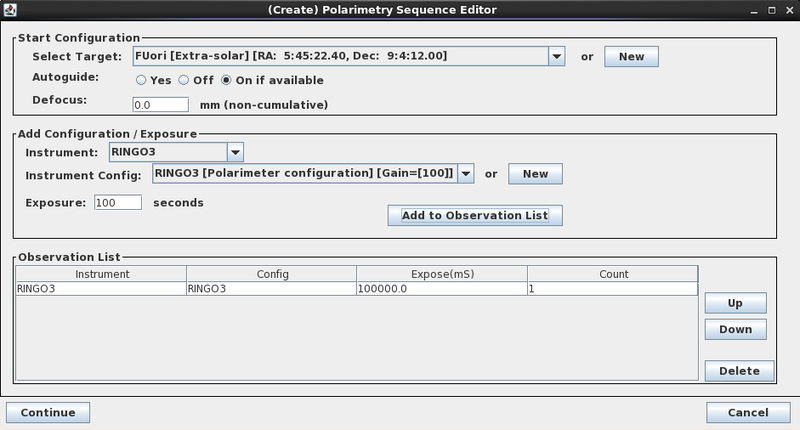 POLARIMETRY INSTRUMENT CONFIG: Configure the instrument. EXPOSE: Obtain sequence of images at a rate of eight per rotor turn. As with all instruments, once created, a group may be displayed, edited, or deleted and subsequently replaced using the buttons at the bottom of the main phase2UI window (highlight the group to see these buttons). 2016-09-21: The numbers here refer to the brightness limit with the new rotor period of 2.35s. VERY IMPORTANT: Contrary to most CCDs, the EMCCD readout register in RINGO3 can actually be permanently damaged by saturation. Therefore, no star brighter than a visual magnitude of ~10 should be allowed in the instrument field. This issue is not affected by the exposure time chosen in the wizard. As noted above, the CCD is read out eight times per polaroid rotation, regardless of exposure time. If your targets are brighter than 10th magnitude, please contact us BEFORE preparing your observations. Remember that observing groups that are enabled are immediately active and, depending on scheduling constraints, could be observed at any time. Bright targets should always be observed with the telescope defocused. Your science observations and the unpolarized calibrator stars that we routinely observe for all users (see below) must all be observed at the same physical cassegrain derotator position, because the instrumental polarization signature depends on the physical alignment of the telescope's tertiary fold mirror. By always observing at the same mechanical mount position, this alignment remains consistent between data and calibrator. Though observations can be obtained with the cassegrain at any orientation, we recommend that all RINGO3 observations be performed at a mount angle of 0. Note that the RINGO3 wizard does not offer a choice of rotator angles. This does mean that each observation will be observed at a different sky position angle; but this is much easier to cope with than having to carefully match standards to the orientation each science frame. If the Wizard is used to prepare your RINGO3 observations, the cassegrain mount angle will automatically be set correctly to zero. See the RINGO3 web page for further details. The only adjustable instrument configuration for RINGO3 is the electron multiplication gain. Unless you have specific reasons to do otherwise we suggest using the default GAIN of 100 for all observations. As noted above, in the wizard users must specify the total 'dwell' time on the target. This parameter is referred to as the "Exposure Time" in the phase2UI. Eight images will be obtained per rotor turn; one image per 'polaroid orientation'. The images at each orientation will subsequently be co-added by the reduction pipeline. See the RINGO3 web page for further details on the pipeline. The overheads associated with initialising the RINGO3 instrument for an exposure mean that exposures shorter than about 5 - 6 sec are likely to be incomplete and unusable. We therefore recommend a minimum integration time of 20 sec for all RINGO3 exposures. Compared to slew and other overheads, the difference between a 5 sec and a 20 sec integration would not represent a significant impact on your time allocation. Please follow the guidance on the Phase2 UI User Instructions for IO:O pages. The only RINGO3-specific consideration is that you should not use +ve DEFOCUS values. This is the only instrument for which we suggest using -ve values. Two sets of calibrators are required. Zero polarization stars are used to correct both science frames and standards for the polarization signal imprinted by the telescope, principally because the beam is folded. As discussed earlier, these zero calibrators must be obtained at the same cass mount angle as the data being corrected. As with any polarimeter, there will be some degree of depolarization caused by scattering in the telescope optics. Known polarized stars are thus used to calibrate the absolute polarization. Users may of course collect their own standard star observations. However, we are running a public program of standards, the data from which are available to all users. These are all observed at a mount angle of 0. The public standards star observations are available from the (Data Archive) under Proposal ID = RINGOStand. Recent standards are also available from the Recent Data page. There are relatively few RINGO3-specific considerations. Please follow the guidelines in the Phase2 UI User Instructions for IO:O, except of course that when nominating an instrument from a drop-down list, such as the FOCAL PLANE command, RINGO3 should be selected. RINGO3 never uses the "N frames of X seconds" multrun format that is commonly seen with the other instruments. If you need to change the duration of your RINGO3 observation, in the Editing Observations Sequence window, highlight the "[Exposure](Duration)" line in the sequence and click on Edit. Always leave the "Exposure" set to duration, and simply update the "exposure time", remembering that this is the total time spent on your target. Though you can set any rotator mode you wish for your specific purposes we recommend always using MOUNT=0 as the rotator configuration for RINGO3. See the discussion above for further details.